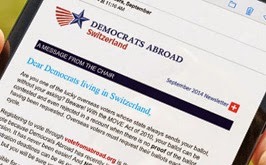 Democrats Abroad Switzerland will be at Table 91 to welcome all who stop by, discuss details of voting from abroad, and sign up American citizens who would like to join Democrats Abroad. We are also calling for volunteers to staff the table. Your task should you choose to accept it is tell any and all who stop by the booth about voting from abroad and Democrats Abroad, and sign up Americans as new members. People are intrigued when they see our name and gladly stop by to find out. It's fun, you can learn more about DA and voting from abroad, you meet Americans interested in US politics (and who isn't at some level? ), and above all, you'll contribute to Democratic electoral success in 2016! Can you spare three hours this Sunday? The pay is low (OK, it's zero) but the rewards high in fun, making contacts and enhancing civic awareness. If you can do only two hours, respond anyway! Email vice-chair@democrats.ch and sign up for a shift.